Where is the snow in Europe and North America? Deep snow at Stowe Mountain Resort, 12/27/2012. It’s a snowy new year in most of the world’s ski areas and therefore a happy one for virtually all! In Europe the rate of snowfall is up again in the Alps over the last week compared to the fortnight before Christmas with falls of up to 60cm since Christmas, with France and Switzerland reporting the biggest accumulations. Elsewhere in Europe Finnish and Swedish ski areas have seen a snowy seven days too, boosting base depths by up to a third. However the biggest accumulations have been reported in the USA where both east and west coast ski areas have reported more big snowfalls of up to a metre in seven days. Snow has been falling in France over the past week in greater volumes than the previous fortnight. Val d’Isere tops the table for the most new snow with 70cm since Christmas. Many other top resorts have reported 30-60cm of new snow in the past week including La Plagne (47cm), Flaine (45cm), Avoriaz (38cm) and Val Thorens (32cm). Pistes are widely reported as being in excellent condition as a result. Most major French resorts now have a snow base on upper slopes of at least 1.8m with Argentiere in the Chamonix valley topping the snow depth table with 3.5m. La Clusaz and Les Arcs remain in joint second place with 3m on upper runs. Resorts in the Tyrol typically received 20cm of fresh snow in the 48 hours after Christmas Day and it has been snowing again this week. Ischgl had 45cm of new snow and the high-altitude resorts of Galtur and Kaprun have had 40cm each. Other big falls were reported at Lech (35cm) and at Obergurgl (32cm), which already had one of the two deepest snow bases in the country. It’s base depth is now 2.15m. The Pitztal glacier ski area has the deepest snowpack in Austria (2.25m) at present and is the only other major Austrian ski area reporting more than a 2m base, although most have perfectly healthy base depths of 1-2m. There has not been a huge amount of snowfall in Italy over the past week. Cervinia continues to report the deepest snow in the country at 2.4m, but that is down 20cm on a week ago and the resort reports only 5cm of new snow accumulated. Arabba in the Dolomites reports the largest amount of new snow since Christmas with 41cm in the past seven days, taking upper slope base depth to 1.6m. The glacier slopes of Val Senales were close behind with 40cm of new snow taking upper slope base depth to 1.8m. A number of resorts besides Cervinia now have 2m base depths including La Thuile and Passo Tonale (both 2m) and Madesimo with 2m. Livigno is a little way behind with 1.75m of snow, 10cm of it fresh. The third very snowy week in a row for British favourite Verbier which has reported another 75cm of snow since Christmas; 1.1m in the past fortnight and it now has a 2.4m base on upper slopes. However Andermatt, with 3.7m base, continues to report the deepest snow in the country, and indeed all of Europe, although it only got 3cm of fresh snow in the past seven days. Other Swiss ski areas to have received snow since Christmas, include duty-free Samnaun with 30cm; Laax with 40cm; and Murren in the Jungfrau with 39cm. But right across Switzerland conditions are largely good with fresh snow and deep bases. Another dry week in the Pyrenees with no fresh snow reported, however snow bases are generally holding up and although pistes are hard packed, conditions are generally good. The deepest snow in Andorra is at Pas de la Casa with a 1.1m base. Spain’s Formigal (1.35m) just over the border has some of the deepest snow. It’s a slow start to the season at Europe’s most southerly resort, Sierra Nevada, however. This can often reach a 5 or 6m base, sometimes the deepest in Europe, but so far there’s only 20-40cm of snow. There’s been little new snow in Eastern Europe in the past week but Bulgaria’s leading resort Bansko is still reporting a metre deep snow on its upper slopes, although the smaller resort of Pamporovo has 1.3m. Further west in Slovenia, Kranjska Gora is struggling with a snow depth of 30cm and only 15cm on lower runs. It’s been snowing in Scandinavia. In Finland: Yllas is reporting some of the best conditions with 22cm of new snow in the past week, building base depths to 65cm across the ski area. There’s been less new snow in Norway but Hemsedal and Lillehammer both now have more than a metre deep snow on upper slopes and are both reported to be in great shape for the start of 2013. Are in Sweden, the biggest area in the region and perhaps the most in need of snow, has had its Christmas wish granted with 23cm of new snow taking its base up by a third to nearly 60cm allowing it to open much more terrain for the new year. Warmer temperatures and torrential rain (interspersed with heavy snowfall) are the latest challenge for Scotland’s ski areas, and strong winds remain an intermittent problem, but all five remain open at present. For once eastern Canada has been receiving as much or more snow than western Canada over the past seven days. The snow is still falling in the west but it has slowed, whereas Quebec and Ontario have benefitted from large snowfalls moving up from the US. Mont Sainte Anne and Tremblant in Quebec have both received another 20cm of snow in the past week while Mont Sutton down on the US border now has an upper slope base depth of 1.5m following three snow alerts for heavy falls in the past week. Conditions remain excellent in the west however, Fernie received another 20cm of snow too and has some of the deepest snowpack in the country at 2.13m, beaten only by Red Mountain with 2.2m after the biggest snowfall reported in Canada in the past seven days – 45cm. It still looks good at Whistler although its base has dropped back below 2m to 1.86m despite another 10cm of snow this week. US resorts have been reporting the world’s largest snowfalls for the second consecutive week on both east and west coasts with Alyeska in Alaska, accumulating the most – more than 1.2m in the past seven days. But international destination resorts like Heavenly and Mammoth in California to the south have had lots of powder too – 60cm each since Christmas in fact. Mammoth’s snow depth at 3.81m on upper slopes is the deepest of any major international destination resort in the world right now. There have been more sizable snowfalls for most resorts in Colorado and Utah too, further improving conditions on the slopes in both key ski states. 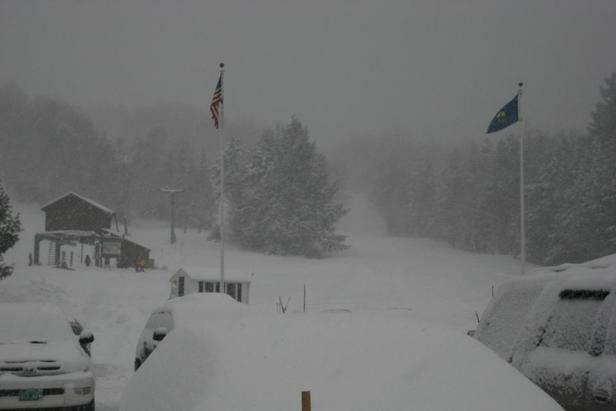 On the east coast the snowfall of last week has continued too, the biggest resort there, Killington in Vermont, has reported another 40cm of fresh snow. We’re expecting a relatively quiet week for snowfall on both sides of the Atlantic. After the recent big storms the rate of new snow arriving in North America will probably slow to inches rather than feet, allowing resorts to consolidate their good position at this stage in the season. In the Alps we’re expecting more moderate snowfall to help keep conditions fresh on top of the already-healthy snow bases, meaning a good week for snow sports in Europe. Our next 'Where is the snow in Europe and North America' report will be published Wed, Jan. 9, 2013.